This exploration of the legendary unicorn delves into historic records of unicorns and likely explanations for the creature’s mythical evolution across centuries. This in-depth analysis explores several cultures not to mention dozens of animals that all possibly contributed to the unicorn mythology. To anyone already well-informed on their unicorns, I don’t think there’s much new here. 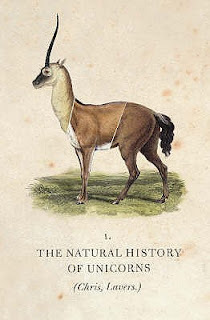 The book can also feel a little technically dense with quotes from old writings about unicorns as well as detailed descriptions of animal species. The speculation becomes somewhat repetitive, too. In short, the theory is that different cultures borrowed aspects of real animals and pieced together this famous creature, which then developed further over time as the stories took on a life of their own. That all said, if you care about the subject matter then this is still an interesting read. For one thing, I learned about a lot of species about which I had never heard before. I also found myself intrigued separating out where certain beliefs originated, be they secular or religious originally as well as geographical origins. This is a detailed scholarly examination of an iconic creature and the truth behind the fantasy.